There goes some of my Money….dammit. It’s showing as a non-ratio variant. There is a 1:50 Jee Hyung Lee variant. I just posted the non-Ratio. There is a non-Ratio and a 1:100 Virgin Variant which this is for. I can show you the diamond solicitation if you want to see it. Ahh, you are correct. The 1:100 virgin had to have been a late add on since it was only showing the open order Artgerm, the Ribic, the Hyung and the basic cover for the longest time. Sent the Black Panther spoilers over Anthony. 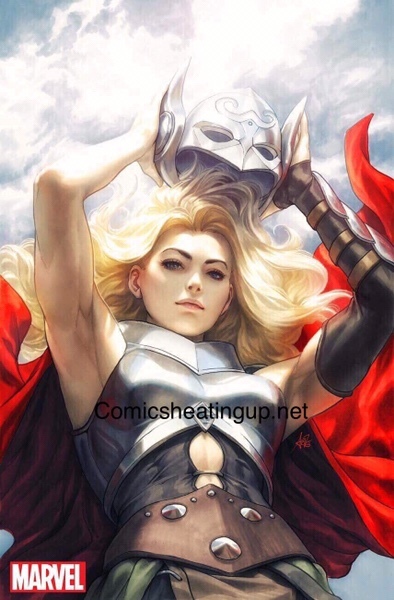 When did Supergirl become Thor? Kinda the same thing right. NOT THE CAMPBELL BUG!!! ??? I’m thinking Natali Sanders doesn’t have the Campbell bug she’s just born to play Harley, X23, Witchblade, Baroness, etc. If she’s using herself to model. The pouty big lip is her thing. That could be argued with Marvel. Lol. Took the words out of my mouth, Poyo.